Tingue heavy-duty laundry cart dumpers empty bulk laundry carts quickly, safely and automatically. 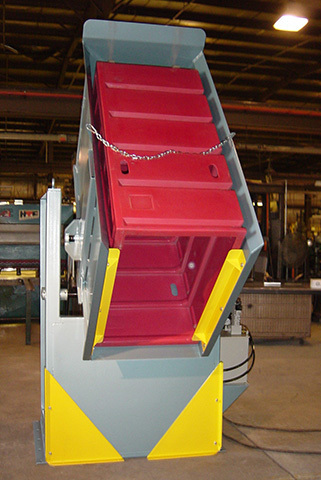 At the push of a button, an entire 800-pound load of soiled laundry is raised, rotated and emptied onto a sorting table or conveyor then returned to position for removal. Worker contact with fully loaded laundry carts is reduced and manual soiled laundry removal is eliminated.